This article contains facts and information about the life and times of the famous Native American Indian chief known as Santana. Santana’s exploits and valor in battle earned him prestige with the Kiowa, and he was made one of the tribe's representatives at the Medicine Lodge Treaty council at Kansas in October 1867. The Medicine Lodge Treaty council was attended by more than 5,000 Native Indians including the Kiowa, Comanche, Kiowa Apache, Cheyenne, and Arapaho tribes. The 7th Calvary was on hand to protect the white negotiators. Although Santana agreed at the treaty council that the Kiowa tribe should live on reservations, the Native Indians delayed their relocation. Colonel George Custer therefore kept Santana as a hostage until the tribe completed the move. The Medicine Lodge Treaty signed in October 1867, did not last. As more and more settlers came into their lands the Kiowa resumed their raids. General Sheridan was ordered to devise a plan to break the will of the Kiowa tribe. General Philip Sheridan’s winter campaign against the Native Indians during 1868-1869 was merciless, brutal and bloody. The U.S. military, under Colonel George Custer not only killed warriors, but also women and children. During the violent campaign their homes and horses were also destroyed. In the face of such destruction Santana and Chief Lone Wolf (Guipago) were forced to surrender. The two chiefs approached Colonel George Custer on December 17, under a flag of truce. Custer ignored the truce and arrested the two chiefs. 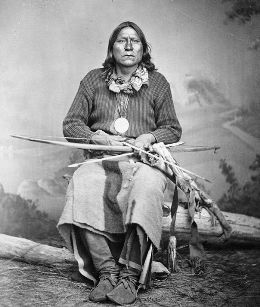 For the following three months, Custer tried to get permission to hang them but in early 1869, they were freed, owing to the efforts of Chief Kicking Bird (Tene-angopte), who promised that the Kiowa would stop raiding and return to the reservation. In 1871, Chief Santana, Chief Big Tree (Adoeete) and Chief Satank (Sitting Bear), led a large party of Kiowas off the reservation and joined forces with a Comanche party, ostensibly to hunt buffalo in Texas. The Native Indians spotted a wagon train traveling along the Butterfield Trail. The combined force of warriors attacked the 10 freight trains hoping to steal guns and ammunition. Seven teamsters were killed. Santana and the others then returned to the reservation. The Indian agent questioned Santana about the raid. Santana admitted that he had led the raid, and that it was justified by the poor treatment they received on the reservation. On June 8, 1871 the Indian agent turned them over to General Philip Sheridan, who sent the three chiefs to Jacksboro, Texas to stand trial for murder. Discover the vast selection of pictures on the subject of the tribes of Famous Native Americans such as Santana. The pictures show the clothing, war paint, weapons and decorations of various Native Indian tribes, such as the Kiowa tribe of Santana, that can be used as a really useful educational resource for kids and children of all ages studying famous Native Americans such as Santana. We hope you enjoy watching the video - just click and play - a great educational resource for kids.